Sibeth Ndiaye: Who's the French government's new spokeswoman? Home https://server7.kproxy.com/servlet/redirect.srv/sruj/smyrwpoii/p2/ World https://server7.kproxy.com/servlet/redirect.srv/sruj/smyrwpoii/p2/ Sibeth Ndiaye: Who's the French government's new spokeswoman? 1; but now will speak for the country. 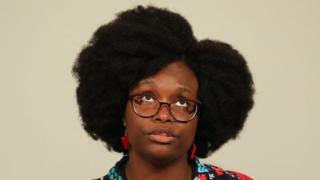 Sibeth Ndiaye, the new government spokeswoman, was born in Dakar, Senegal, and only obtained her citizenship while helping to run President Emmanuel Macron's election campaign in 2016. Ms Ndiaye was born in 1979 in the former French- colonized republic of senegal, a family who engaged here in politics from a young age. Her father was heavily involved with the Senegalese Democratic Party, while her mother was a high-ranking judge on the country's constitutional council. Educated in Senegal and in Paris, she was involved in the French national students' union – later telling news outlet Jeune Afrique that she felt and wanted to make changes to the lives of other students. She said her leap to national politics was prompted by the 2002 French presidential election, in which the far-right National Front's Jean-Marie Le Pen made it to the second round. She joined the Socialists – and began her career in politics. When he declared his presidential ambitions, she joined his campaign team. That decision led to her becoming a media advisor to the President of the Republic. Her appointment to the government in the weekend's minor reshuffle has been with a great deal of criticism and debate in France. Journalists ejected from the Elysee, and a hardening of policy about staff members speaking with journalists. L'Express French newspaper reported in the report, when she said she would protect Mr Macron. Opponents have questioned what such a statement – which she had previously denied saying – meant coming from the government spokeswoman. Ian Brossat, spokesman for the French Communist Party, tweeted: "With the practices of this government, it actually seems to be fitting for the position of spokesperson." the right-wing national rally, echoed the sentiment, saying: "The official official becomes the government spokesperson". Speaking at her first official press conference on Monday, Ms. Ndiaye said the quote had been taken out of context. Earlier, Ms Ndiaye spoke about the importance of her role in government as a naturalized citizen. 19659007] "I took this step with pride in serving France, the country I chose for myself," she said. "Even before I was French, I was one of the people involved in this country, especially in [Paris suburb] Seine-Saint-Denis, where nothing is simple, but where everything is possible. " " France has given me a lot, today it is my turn to give something back, "she said.